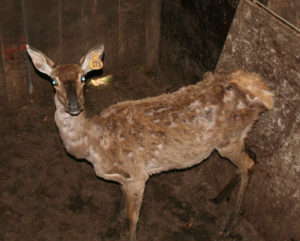 Fallow Deer with clinical Johne’s disease photographed by M.T. Collins on a deer farm in southern Chile. 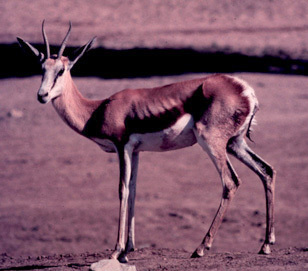 Fallow Deer showing extreme cachexia (weight loss) and evidence of diarrhea due to Johne’s disease photographed by M.T. Collins on a deer farm in southern Chile. North American Elk (Cervus elaphus) on a farm in southern Minnesota. 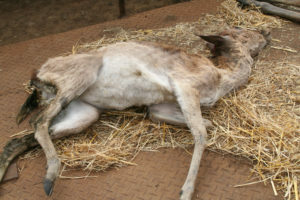 This animal is only 6 months-old and yet is already showing clinical signs of Johne’s disease: low body condition and diarrhea. Deer and elk seem especially susceptible to MAP. The infection progresses more quickly and clinical disease is seen at a younger age in comparison with domestic livestock. 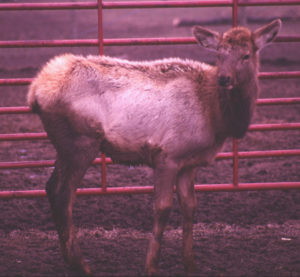 This outbreak of Johne’s disease in elk was described in a publication by E.J.B. Manning et al. Journal of the American Veterinary Medical Association 213(9):1320-1322, November 1, 1998. 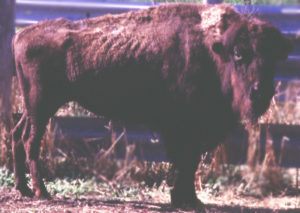 North American Bison with clinical signs of Johne’s disease (thin). Several U.S. bison herds have been found to be infected. Often the clinical signs are not very obvious and the pathology differs from that in cattle. This excellent report be Buergelt et al. gives more detail on the paratuberculosis pathology in bison stemming from an outbreak investigation with multiple cases of paratuberculosis. 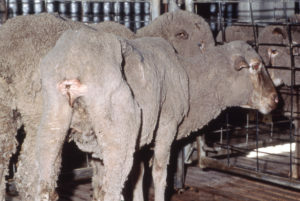 Sheep with clinical signs of Johne’s disease are invariably thin and may sometimes have evidence of diarrhea. Springkbok with clinical Johne’s disease photographed at a zoo in the U.S. Johne’s disease gets into zoos when domestic animals are purchased, e.g. goats for petting zoos. Once on the property it spreads to other animals, in particular ruminants. Domestic ruminants, such as cattle, goats and sheep are the animals most commonly infected by MAP. However, farmed deer, and elk, and ruminants kept in zoos are also susceptible to MAP infection.